Service Carts, Rolling Carts, Utility Carts, Mail Carts for the Office, Laundry Carts for the Home, are all handy time-saving products that work great in the office, shop, or home. With multiple shelves, rolling casters, generous surfaces with sides to hold whatever you're wanting to move, these carts will do the job. Some are metal rolling carts, some are fiberglass rolling carts, and some are plastic rolling carts, and usually the material used are based on the capacity of the intended use. 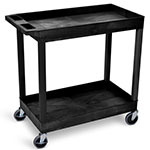 Some Rolling File Carts are made to hold hanging files and move them around the office or from work center. Some Rolling Book Carts work great in libraries as returned book locations or to focus on a certain author or subject. Book Carts also work great in school classrooms.